Won’t say whether he will run in N.H.
“I’m doing exactly what I said I was going to do . 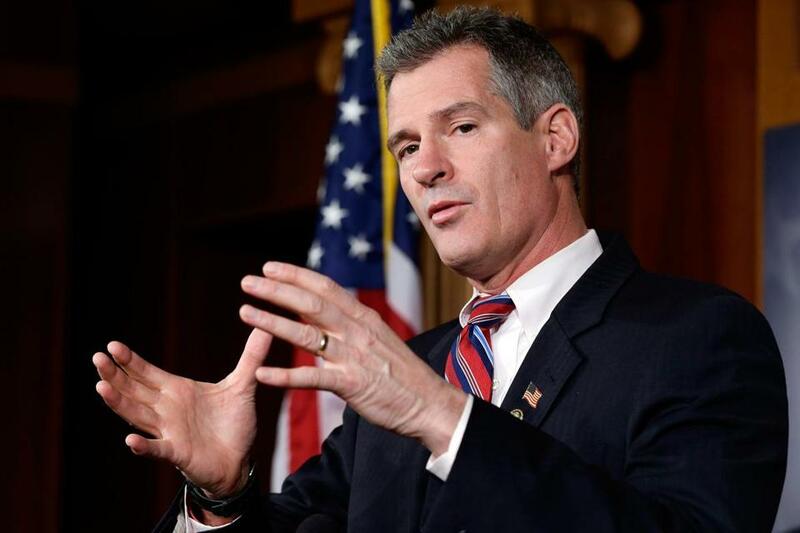 . . traveling around the country helping other committees, individuals, and groups raise money and raise awareness, and try to get my message of problem-solving,” said Scott Brown. Speaking to reporters Monday night outside a function hall, where Brown addressed Republicans at a fund-raiser for local candidates, he criticized Shaheen for raising the specter of a matchup between the two in a recent campaign e-mail. The fund-raiser was closed to the media. In an e-mail Friday to US Senator Elizabeth Warren’s campaign committee, a fellow Democrat who defeated Brown last year, Shaheen wrote that Brown’s visit to Hampstead was his seventh meeting with New Hampshire Republicans in the last six months. Shaheen’s press aides did not immediately respond to e-mail inquiries Monday night. “Scott Brown is dreaming if he thinks New Hampshire wants to send him and his special interest agenda to the Senate,” spokesman Harrell Kirstein said in a statement. Brown, who arrived in a dented GMC pickup truck, did not say if he plans to run for office again, despite rumors of a possible Senate bid in New Hampshire or even a presidential run. He described the GOP as a “big idea party” that has room for Tea Party-backed lawmakers such as Senators Rand Paul and Ted Cruz, but also more moderate figures like himself. His visits to New Hampshire and Iowa, two key presidential primary states, have prompted some political observers to raise the possibility of Brown launching a bid for the White House or perhaps for Shaheen’s seat. Brown announced in August that he will not run for governor in Massachusetts in 2014. He has not ruled out another run for elective office, but has also made no definitive statements about what job he may pursue. He demurred when asked Monday if he was closer to making a decision. His remarks came hours after the Massachusetts GOP filed an ethics complaint against Warren’s chief of staff, alleging that the top aide sent a fund-raising e-mail on government time that mentioned Brown’s possibly running against Shaheen. According to the complaint filed with the Senate Select Committee on Ethics, Mindy Myers, Warren’s chief of staff, sent an e-mail from a campaign account affiliated with her boss on Friday afternoon, while the Senate was in session. Rob Cunningham, executive director of the Massachusetts GOP, wrote in a letter to the ethics committee that Myers violated campaign finance laws because she sent the message from “what appears to be a government office” while she was being paid with taxpayer dollars. “The attached communication makes clear, and an investigation will no doubt confirm, that there is a reason to believe that Mindy Myers has participated in partisan campaign fund-raising activity” in violation of applicable laws, Cunningham wrote. Myers, who managed Warren’s 2012 Senate campaign, could not be reached for comment. Warren’s office said in a brief statement that the campaign e-mail was sent by a private vendor and that no government resources were used. The statement also said Myers is a political fund designee. Such designees are permitted to raise money for Senate campaigns, said Marc E. Elias, a Democratic lawyer in Washington who handles campaign finance and government ethics cases. He is not representing Myers or Warren. Shaheen’s office had no comment on the ethics complaint. Jeremy C. Fox can be reached at jeremy.fox@globe.com. Travis Andersen at travis.andersen@globe.com.